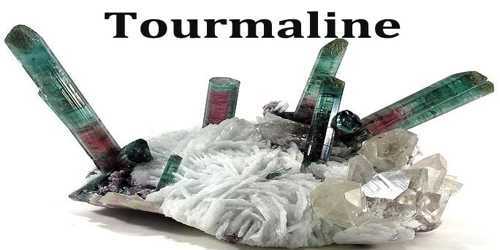 Tourmaline is Any of several minerals having the general chemical formula (Na,Ca)(Mg,Fe,Al,Li)3 Al6 (BO3)3 Si6 O18 (OH)4 . Tourmaline occurs in many different translucent colors, usually in crystals shaped like 3-, 6-, or 9-sided prisms. It occurs in igneous and metamorphic rocks, especially in pegmatites. 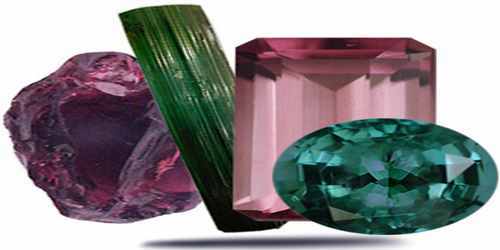 Tourmaline is classified as a semi-precious stone and the gemstone comes in a wide variety of colors. The name comes from the Tamil and Sinhalese word “Turmali” (තුරමලි) or “Thoramalli” (තෝරමල්ලි), which applied to different gemstones found in Sri Lanka. Tourmaline is a birthstone for October, along with opal. Tourmaline is also the gem of the eighth anniversary. Its colors have many different causes. It’s generally agreed that traces of iron, and possibly titanium, induce green and blue colors. 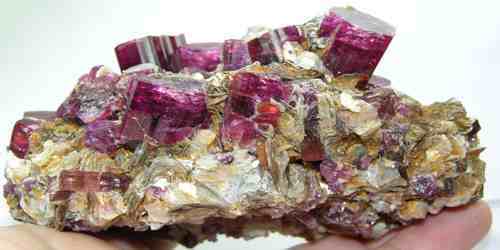 Manganese produces reds and pinks, and possibly yellows. Some pink and yellow tourmalines might owe their hues to color centers caused by radiation, which can be natural or laboratory-induced. Tourmaline was sometimes called the “Ceylonese (Sri Lankan) Magnet” because it could attract and then repel hot ashes due to its pyroelectric properties. The stone was first discovered by Dutch traders off the West Coast of Italy in the late 1600’s or early 1700’s. The name tourmaline comes from the Sinhalese term “turmali,” which the name was given to all colored crystals on the island of Sri Lanka at that time. This all inclusive name indicates the inability of ancient gem dealers to differentiate tourmaline from other stones. In fact, at one time in history, pink and red tourmalines were thought to be rubies. Tourmaline is found in a wide variety of colors from black to bluish-black, dark brown, yellow, medium brown, blue to neon blue, lime to dark forest green, red and reddish purple, yellow, pink, and colorless. Tourmalines are mined everywhere in the world including Africa, Afghanistan, Africa, Australia, Brazil, Kenya, Madagascar, Mozambique, Nigeria, Pakistan, Siberia, Sri Lanka, Tanzania, the USA, and Zimbabwe. Tourmaline is a six-member ring cyclosilicate having a trigonal crystal system. It occurs as long, slender to thick prismatic and columnar crystals that are usually triangular in cross-section, often with curved striated faces. It is distinguished by its three-sided prisms; no other common mineral has three sides. Prisms faces often have heavy vertical striations that produce a rounded triangular effect. Some tourmaline gems, especially pink to red colored stones, are altered by heat treatment to improve their color. Overly dark red stones can be lightened by careful heat treatment. The pink color in manganese-containing near-colorless to pale pink stones can be greatly increased by irradiation with gamma-rays or electron beams. Irradiation is almost impossible to detect in tourmalines, and does not, currently, impact the value. Heavily-included tourmalines, such as rubellite and Brazilian Paraiba, are sometimes clarity-enhanced. A clarity-enhanced tourmaline is worth much less than a non-treated gem. Tourmaline is believed to strengthen the body and spirit, especially the nervous system, blood, and lymphs. It is also thought to inspire creativity and was used extensively as a talisman by artists and writers. Tourmaline has been said to be good for keeping the digestive system healthy as well as strengthening teeth and bones. It is also recommended for the adrenal disorders and is used by modern practitioners to treat stress and trauma. Tourmaline is used in making of rings, bracelets, pendants and necklaces; the uncut tourmaline can be worn as a chunky jewelry for a more natural look. Tourmaline is also used as a polarizing device. 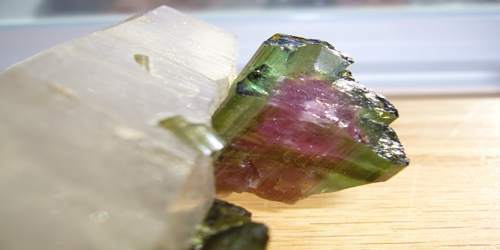 When two slices of tourmaline are cut right the right way along certain axes or lines then light can be blocked if one piece of the tourmaline is held in front of the other. For this reason, many people use tourmaline tongs for polarizing purposes.